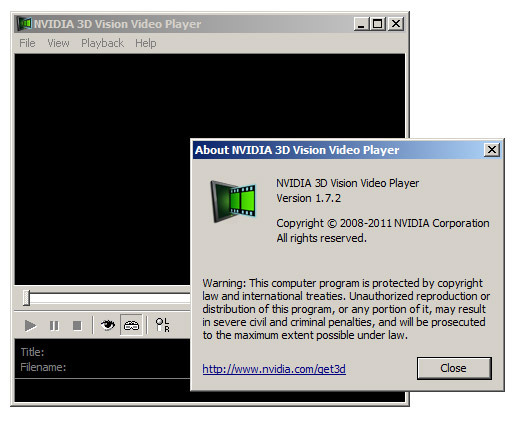 Nvidia has also released an updated version of the 3D Vision Video Player Version 1.7.2 along their latest 280.19 beta GeForce driver (the latest Stereoscopic Player is version 1.7.3 and it has some extra features). The most interesting thing in the new 3D Vision Video Player 1.7.2 is the support for Windowed 3D mode along with the MVC decoding support, have in mind however that there is no MVC decoded included in the package. And although the Player can now decode MVC with a proper additional codec, it does not mean that it will be able to play encrypted Blu-ray 3D movies, for that you would still need to use a full featured Blu-ray 3D software player such as PowerDVD for example. The MVC decoding support is good to have if you are recording for example video in MVC format with a 3D camcorder or need to play back such content without having to convert it in another format, again yo would need to have a proper decoded for MVC installed additionally. – Added support for 3D Vision Window mode. Please view this knowledgebase article for more information on 3D Vision Window Mode. – Added support for interlaced MVC content. – Added support for MVC content in MP4 containers. – Added ‘default’ option in full screen monitor menu. – Added error message when opening encrypted Blu-ray files. – Added option for DMX512 output to send only used channels. – Fixed issue with Coraline Blu-ray disc. – Fixed seeking deadlocks with left/right *.m2ts files. – Fixed exception when calling GetDuration automation command on still files. – Fixed that player doesn’t close file handles of jpg files. – Fixed long load delay with certain files when ffdshow Video Decoder is used. – Fixed error after resume from sleep mode. – Fixed DirectX recreation error after fast user switching. – Fixed compatibility issue with DivX Demux Filter. – Fixed issue with H.264 AVIs with resolution greater 1920×1080. – Fixed issue when opening left/right *.m2ts files from Blu-ray 3D discs.